My brother gave me plenty of reason to feel I am not a no hoper on two wheels this week. After all, I had started to worry that my biking skills were not coming up to scratch quickly enough for the London Triathlon. The middle bike section is the bulk of the challenge, 40k in London, so if you make it your strongest, it will greatly help with your time. Needless to say, in the two sprint triathlons I have done so far, I have pushed myself hard on two wheels. But my times, well, could do with some improvement. I don’t boast a proper road bike but my town and trail version is up to the job. I just started wondering, am I? I feel like I am getting stronger, feel like I am getting better out on the open road when training. There are still three months until London, so plenty of time to improve further. But that is where I come back to my brother, Gary, who has given me the perfect boost. He is less than two years younger and recently decided to get fit again, buying a book “Scrawny to Brawny”. Well, he soon jacked that in and is definitely siding on the scrawny side still. So a couple of weeks back he bought a new bike to help quicken the two-mile commute to the city centre in Bristol for his place of work. This was his latest fad. But within days, he had an accident. Not serious, I might add. Somehow as he turned left down a street, his bike went right and his handlebars fell off. Cue Gary being cannoned from his bike, scuffing his nice suit, buckling his wheel, shattering his breaks. His wheel bent, he chose to abandon his new bike in a hedge. Had he stuck to his earlier book, maybe he would have had the strength to carry it home and repair it. Luckily, the bike came off worse than him. So maybe my biking skills are not so bad after all. I just need to keep working, keep up the miles, increase the hill work and fight through the pain barrier. 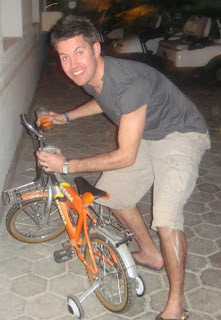 And, unlike the younger Roden, I must remember to keep my handlebars tightened up at all time. After all, your handlebars falling off is embarrassing enough on a dark night in a quiet street in Bristol. Never mind in front of hundreds of spectators in the centre of London.